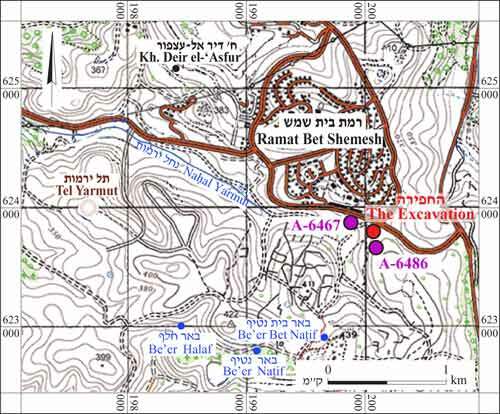 During March 2012, a salvage excavation was conducted at Ramat Bet Shemesh (Permit No. 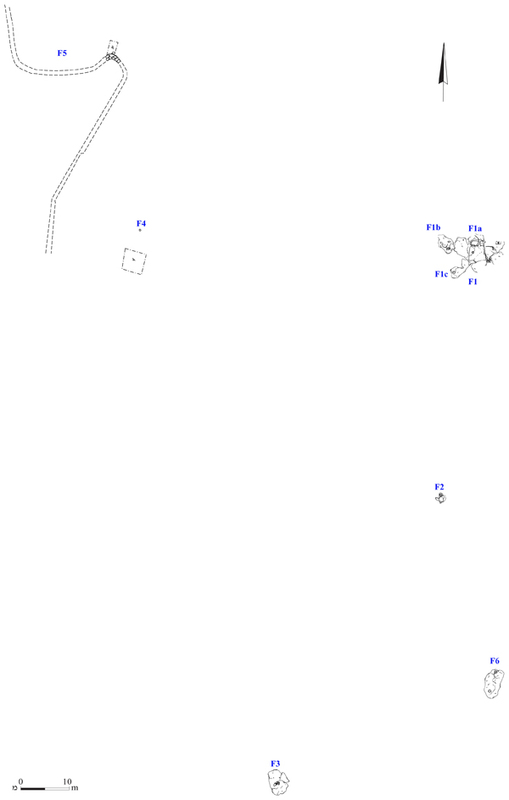 A-6466; map ref. 200011–36/623727–858; Fig. 1), prior to construction. The excavation, undertaken on behalf of the Israel Antiquities Authority and underwritten by the Ministry of Construction and Housing, was directed by E. Kogan-Zehavi, with the assistance of N. Nehama (administration), M. Kahan and R. Mishayev (surveying), A. Peretz (field photography), C. Hersch (pottery drawing) and E. Belashov (drafting). Additional assistance was rendered by D. Ben-Ami and P. Betzer. The excavation was carried out on a flat hill, alongside which rock-hewn and built agricultural installations were exposed (F1–F6; Fig. 2). Previous excavations in the vicinity exposed caves, a winepress, cisterns, rock-hewn installations and an ancient road (HA-ESI 124; Permit Nos. A-6467, A-6484, A-6485). 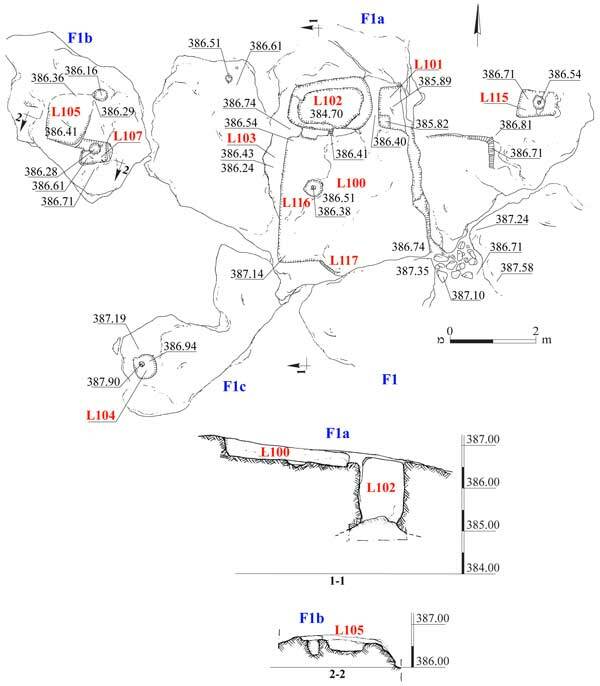 Architectural remains, terrace walls, caves, a stone clearance heap, rock-hewn agricultural installations and quarries were identified in a survey that preceded the excavations (HA-ESI 122). F1. 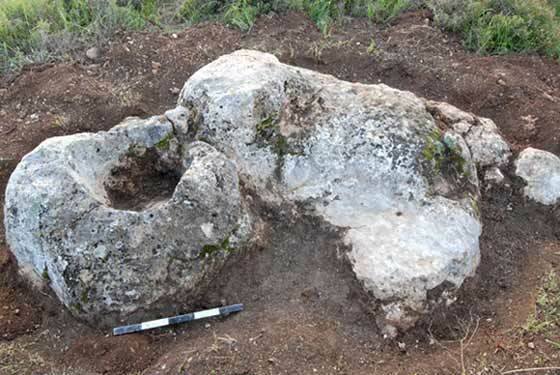 Three rock-hewn installations for the production of wine and oil were exposed: a winepress, a bodeda and a basin. The winepress was a simple installation (F1a; Figs. 3, 4) consisting of a rectangular treading floor that sloped to the north (L100; presumed dimensions 2.8×4.0 m), a rectangular settling vat (L101; 0.75×0.85 m, depth 0.5 m) and a collecting vat (L102; 1.05×1.80 m, depth 1.85 m) whose eastern side was curved and its western side was rectangular with rounded corners. 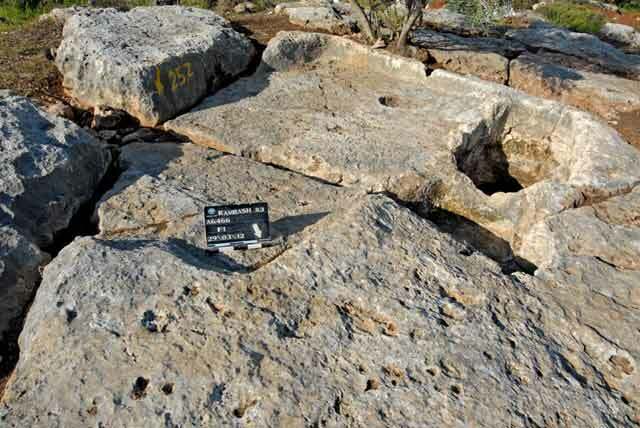 The winepress was cracked due to the shifting of the nari bedrock; the eastern side of the treading floor was damaged and the settling vat was split in two. A cupmark (L116; diam. 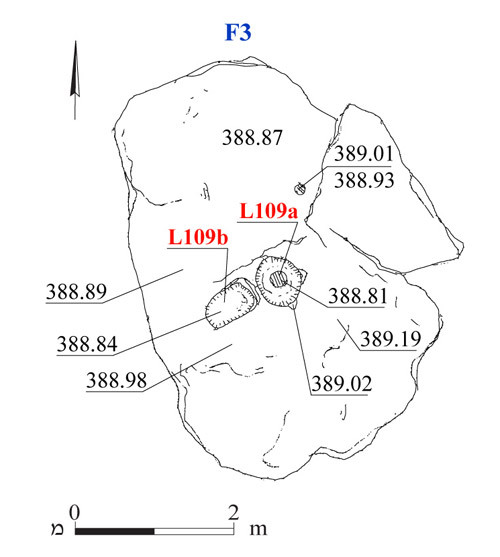 0.4 m, depth 0.13 m) with a circular depression in its center was hewn in the western part of the treading floor. A fissure (L117; length 1 m, width 0.75 m) that opened up on the southern edge of the floor was blocked with small and medium fieldstones. A square sump (0.2×0.2 m, depth 0.07 m) was hewn in the southwestern corner of the settling vat’s floor. 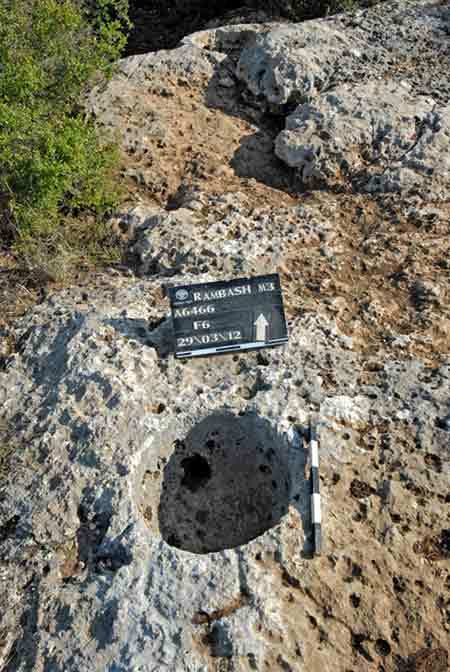 The shift in the bedrock destroyed the connection between the treading floor and the settling vat; hence, it was unclear how the must flowed from one installation to the other. A recess, which was the remains of a channel that led to the collecting vat, survived in the western side of the settling vat. The collecting vat was made wider and deeper in a later phase and a piriform cistern was installed in its place (see a similar phenomenon in HA-ESI 124). 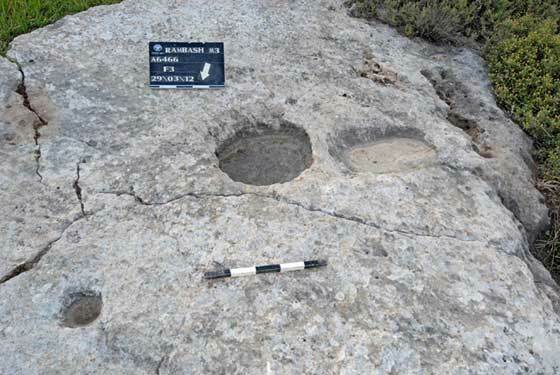 Other installations were excavated around the winepress: a small hewn extracting installation consisting of a work surface (L115; 0.50×0.75 m) in whose center was a hewn cupmark (diam. 0.25 m, depth 0.25 m). That installation was probably meant for crushing plants that were added to the must to improve its flavor. Another rock-cut cupmark was located west of the collecting vat. Several potsherds dating to the Early Roman period were found on the winepress’ treading floor, among them ribbed body sherds, a bowl rim (Fig. 5:1) and a cooking pot rim (Fig. 5:4). The bodeda (F1b; Fig 6) consisted of a treading floor (L105; 1.0×1.2 m) and a circular collecting vat (diam. 0.25 m, depth 0.2 m) linked by a broad channel. Adjacent to the southeastern side of the treading floor was another installation, composed of a square work surface (L107; 0.5×0.5 m) with a round depression in its center (diam. 0.25 m, depth 0.3 m). The basin (F1c) was hewn in a leveled bedrock surface and had a rock-cut depression in its bottom (L104; diam. 0.5, depth 0.25 m). F2. A round cupmark (L108; diam. 0.5 m, depth 0.3 m; Figs. 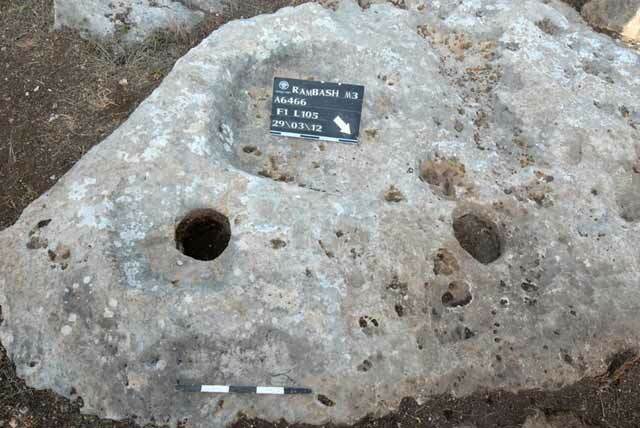 7, 8) with a curved bottom was hewn in natural bedrock, c. 30 m south of the winepress. F3. A small rock-hewn bodeda (Figs. 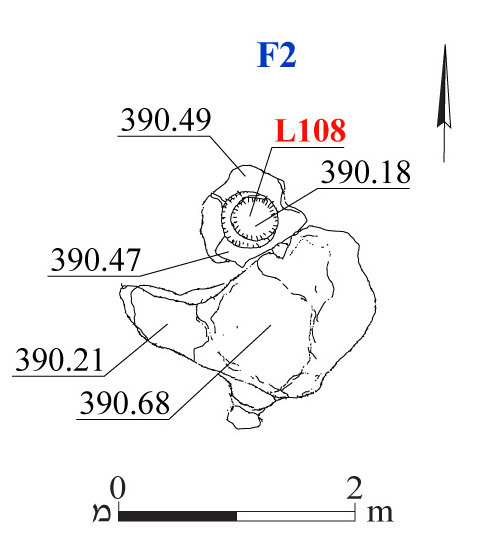 9, 10) was exposed c. 100 m west of the winepress. Nearby were a basin (L109b; 0.45×0.58 m) and a round depression (L109a; diam. 0.12 m, depth 0.04 m) that were linked by a short channel. The installation was probably used for pressing herbs. F4. A round cupmark hewn in a leveled bedrock surface was exposed (L110; diam. 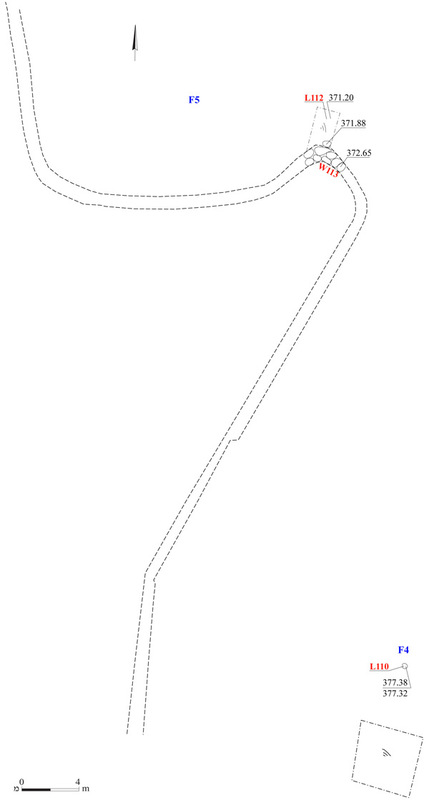 0.15 m, depth 0.1 m; Fig. 11). Several ribbed body fragments were discovered in soil fill that had accumulated east of the cupmark, among them a base of a bowl from the Byzantine period (Fig. 5:2) and a rim of a cooking pot from the Early Roman period (Fig. 5:3). F5. An enclosure wall (W113; Fig. 11) built of fieldstones on clay soil fill was exposed. A probe (L112) was excavated and contemporary finds were discovered; hence the enclosure wall was built in the modern era. Several body sherds were discovered in the fill beneath the wall and on the bedrock, including a jug rim that dated to the Byzantine period (Fig. 5:5). F6. 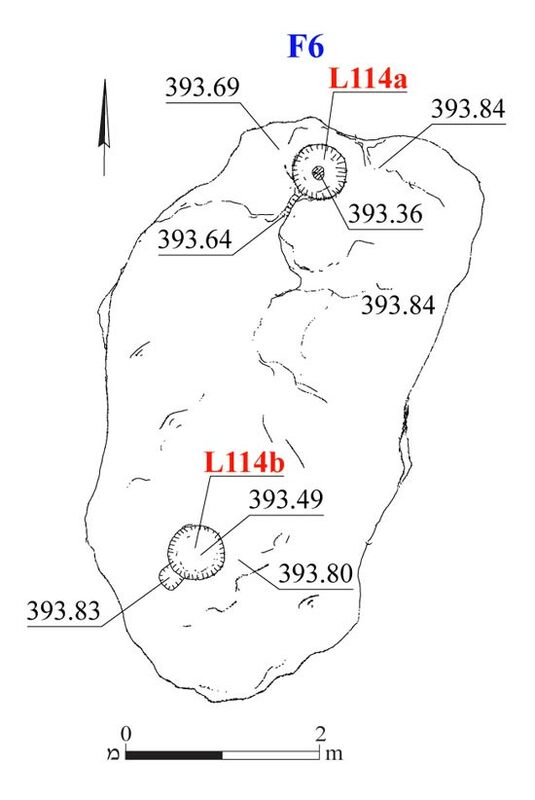 Two rock-hewn installations (L114a, L114b; Fig. 12) were revealed. Installation 114a consisted of a round vat (diam. 0.35 m, depth 0.3 m) at whose bottom was a depression connected by a channel to a flat bedrock surface that was mostly destroyed. Installation 114b consisted of a small rectangular surface (0.10×0.25 m) next to a round vat (diam. 0.4 m, depth 0.3 m; Fig. 13). The installations were probably used to extract liquids. The finds recovered from the current excavation and from surveys and previous excavations are indicative of extensive agricultural activity. The region apparently served as the agricultural hinterland for the residents of Khirbat Umm edh-Dhiyaba. The multitude of wine presses shows that the main branch of agriculture was the cultivation of grapevines for the production of wine. The ceramic finds date to the Second Temple and Byzantine periods and the installations can presumably be ascribed to these periods. 4. Winepress F1a, looking south. 6. Bodeda F1b, looking southwest. 8. Cupmark F2, looking east. 13. Installation 114b, looking north.